Watching YouTube isn't like it used to be anymore. Getting force-feeded by ads that are promoting shady investing schemes is a new phenomenon. 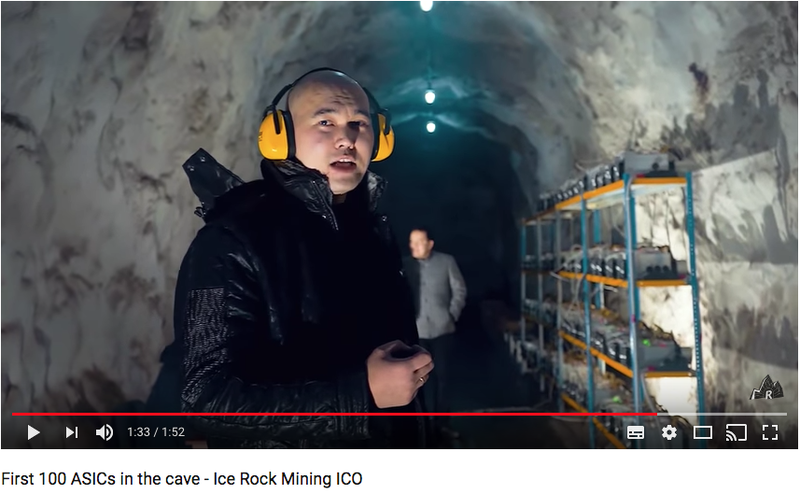 First there was the BunnyToken ad that got my attention, now there's Ice Rock Mining. 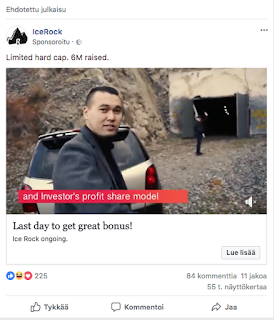 Ice Rock Mining has been advertising on YouTube and Facebook. In addition they have published several advertorial pieces and "press releases" on cryptocurrency related websites, for example on Cointelegraph and Merkle. Although these advertorials and press releases are paid content, they are easy to misinterpret as articles published by an author of the website. This is probably the very reason why various scams are nowadays marketing themselves via these platforms. Ice Rock ad video on Facebook. Here's a link to the ad on YouTube. 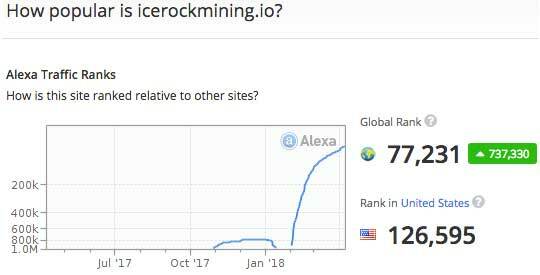 Alexa.com shows that traffic to Ice Rock's website has rapidly grown, so the marketing campaign is likely paying off. The ad video on YouTube has already been viewed over 6.7 million times. Ice Rock Mining claims to produce significant profits from mining Bitcoin in a former Soviet military bunker due the relatively cold temperatures of the bunker caves and low power costs. The CEO of the company, Malik Murzashev, is said to own the facilities. Creating a New Capital Market"
There's also a confusing ICO (Initial Coin Offering) attached to all this. 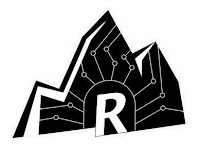 The ICO was started January 20th 2018 and includes a token called ROCK2. I have tried to figure this out, but still don't quite understand what is the purpose of this ICO with a future cryptocurrency that has no use outside the system. According to the white paper of the project "ROCK2 token is an Ethereum based token, which gives you the right to own a share of the profit in the project according to the number of tokens you have purchased". "What's your ROCK2 token do? 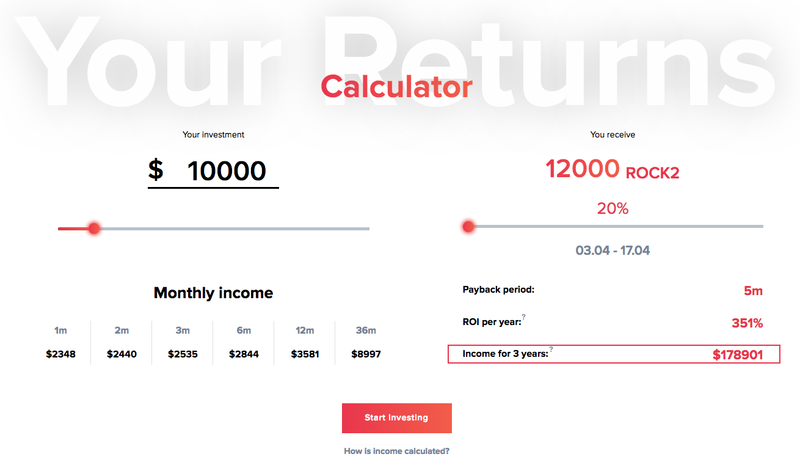 ROCK2 token is created to calculate the share of investment in ICO. It will help you to get mined currency via smart contract. It is based on Ethereum ERC20 protocol." – Yeah, but why do you need this kind of silly token system and what is the purpose of the ICO? "Once the ICO is closed will your ROCK2 tokens be tradeable and if so where? The price of ROCK2 on the free market will be very high because these tokens are the One Way ticket to Comfortable existence until the end of your Life. For now, we deal with etherdelta.com, later other big exchanges will list us." – Comfortable existence until the end of my Life? Come again? And how on earth they can make such promises about the future price of ROCK2? It seems that they are just pulling assumptions out of thin air. "Payouts will be provided in ETH because we will use Smart Contract based on Ethereum platform, (it can show how much ROCK2 tokens each backer has) so all we need is to convert mined BTC into ETH and put it on the smart contract address. It will make automatic payment according to our business plan." 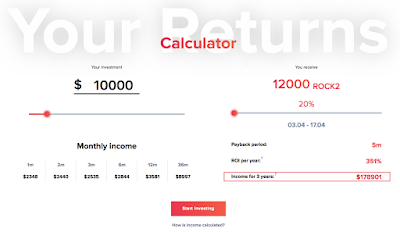 "Can you give me an example in dot point form please on how I will make money if I invest. 50% of the profit will be delivered to our ICO2 backers (holders of the ROCK2 token). Other 50% = 20% electricity and maintenance + 20% REINVESTMENT (buying NEW ASICS and fixing old ones) this part will help to serve and increase the capacity of Ice Rock. And your profit will increase every month + We get 10%"
– Dear Ice Rock Whatever, expenses and running costs aren't profit. This is basic knowledge of economics. Were these texts on the site written by an over-enthusiastic 15 year old? The team presented on Ice Rock's website seems to be real. I didn't check all of them, but the most prominent ones of them appear on several videos and I don't think they are even using fake personalities. Despite the project is seemingly transparent the companies behind Ice Rock are quite opaque. Digging up information leads to a p.o. box company who has been incorporated by two offshore companies. The company in charge of Ice Rock Mining ICO is Woodland Networks L.P., a p.o. box company registered in Northern Ireland July 14th 2017. Woodland Networks L.P. was incorporated by two companies from Marshall Islands, Bondwest AG and Entervox AG, with a capital of 1.000 GBP. There wasn't information available of the managers of these companies. I didn't manage to find information why a p.o. box company in Northern Ireland is needed for running the ICO. Maybe just to bring credibility to the project? The equipment the company claims to use for mining is Antminer S9, which is a state of art hardware specifically designed for Bitcoin mining. Based on many reviews online, currently Antminer S9 is the best and most expensive hardware available for mining. Ice Rock published a video on their YouTube channel November 6th 2017 to show the first batch of Antminers – apparently 25 pieces – they had ordered to be installed in the mining facility. One Antminer S9 costs about 2000 dollars/euros (according to the information by Ice Rock itself the price is 2300 U.S. dollars). So 25 pieces of them costs roughly 50.000 euros. There are also other video material showing evidence that they actually have some mining equipment and the existence of the mining facility, the former Soviet bunkers. Whether the mining is actually happening, or whether it is to benefit their investors isn't clear. A video clip published 27th of February 2018 shows a rack of running hardware. 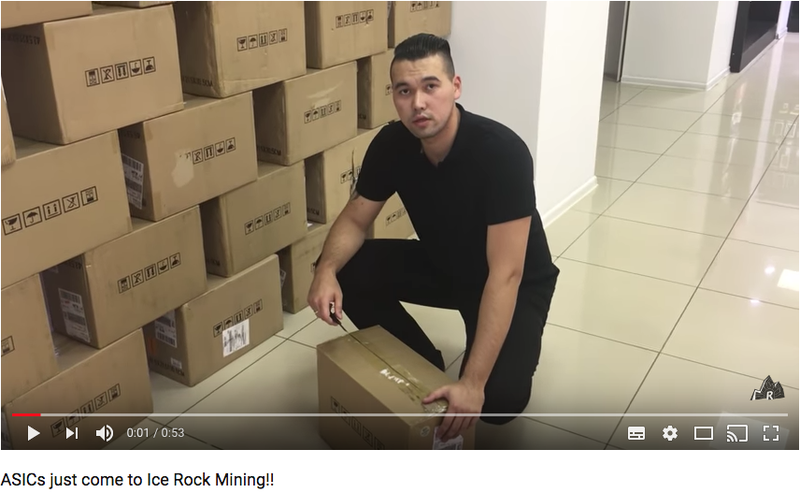 There's allegedly 100 pieces of Antminer S9's there. Overall cost of that hardware exceeds 200.000 euros. The equipment doesn't come free of charge, so the Antminers accumulate profit only after the investment to the equipment has been covered, not to even mention other expensess. Several reviews about Antminer S9 indicate that it could take several months maybe even close to one year to cover costs of those miners (Ice Rock is implying that their investors get their money back in 5 months). The amount of Bitcoins generated monthly can vary, the value of Bitcoin is highly volatile and the difficulty factor of mining is increasing so estimating profitability of a Bitcoin mining farm is very hard. "ROI of 439% per year is easy to explain thanks to 20% monthly reinvestment which will increase the capacity of Ice Rock Mining farm. And we do not spend on cooling systems. That is why we are more profitable than other mining farms." – Alrighty, what happens if and when you reach your maximum capacity? How many investors can profit from this? How can you ensure a continuous increase of capacity of the mining farm? What happens if and when the operation of the company turns out to be unprofitable? "Bitcoin mining is a highly volatile investment who's returns can vary drastically on a daily basis. Our calculations were made when Bitcoin price was $14,000 (USD). Other factors that cannot be accurately quantified such as network difficulty and hashrates will impact your returns. Neither we, nor anyone else, can guarantee returns, the above mentioned calculator is for information purposes only." – Yet Ice Rock promises profits for a lifetime with a lifetime contract. You will have a lifetime contract with Ice Rock. 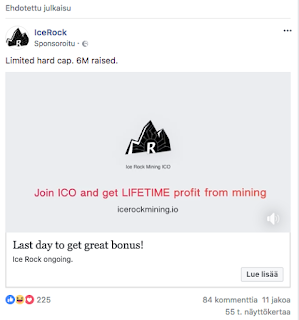 The video ad of Ice Rock is promising "lifetime profits", and yes, they have used caps for the word lifetime. 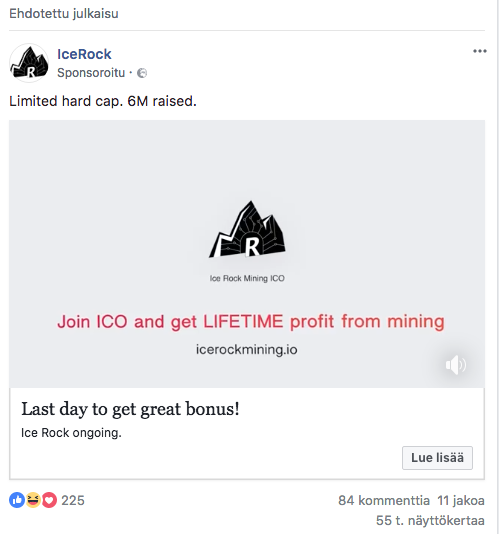 Ice Rock doesn't seem to limit the number of investors who can invest and profit from the mining. That been said, there's a strong odour of ponzi scam. The amount of investors they have attracted could have already greatly exceeded the capacity, which enables them to share promised profits to the investors. All things considered I find very alarming the way Ice Rock is promising "lifetime profit" to its investors regardless the very high risks involved. The marketing campaign online and the business model requiring continuous growth shows strong features of a ponzi scam. Generally speaking this is not the way any legitimate business would be marketing itself or doing business.